1. Right to foreclosure: Foreclosure means debarring the mortgagor form exercising his right of redemption. It can be exercised by obtaining decree from the Court to that effect. According to Section 67 of the Transfer of Property Act “In the absence of any contract to the contrary, the mortgagee has, at any time after the mortgage money has become due to him, and before a decree has been made for redemption of ht mortgaged property, a right to obtain form the Court a decree that the mortgagor shall be absolutely debarred of his right to redeem the property”. A mortgagee under an anomalous mortgage, which authoresses the mortgagee to exercise such right. 2. Right of suit for sale: The mortgagee may bring a suit for sale in place of a decree of foreclosure. A suit for foreclosure differs from a suit for sale. In case of foreclosure the mortgagor is debarred form the right of redemption and the mortgagee becomes the absolute owner of the property, while in case of sale, the mortgagee is entitled to recover his dues from the sale proceeds of the property. Where the mortgagor binds himself personally to repay the money (e.g. in case of simple and English Mortgage). Where without the fault of the mortgagor or the mortgagee the mortgaged property is wholly or partially destroyed or the security is rendered insufficient and the mortgagor fails to provide further security to render the whole security sufficient in spite of a reasonable notice. Where the mortgagee is deprived of the whole or a part of his security by or in consequence of the wrongful act or default of the mortgagor, or where the mortgagor fails to deliver the possession or guard such possession form a person claiming superior title, in a case where mortgagee was entitled to the possession. 4. 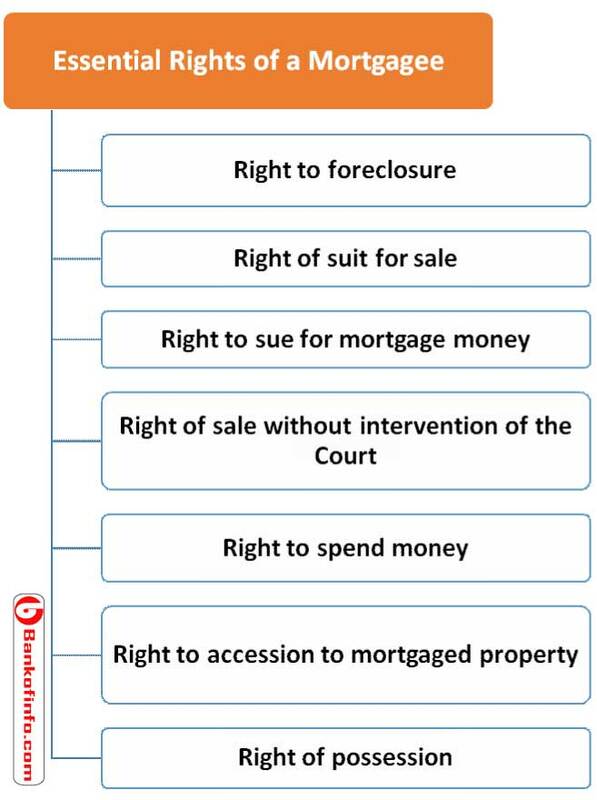 Right of sale without intervention of the Court: The mortgagee may sell the mortgaged property without the intervention of the Court in each of the following cases. Where the mortgage is and English Mortgage. Where the power of sale without the intervention of the court is expressly conferred on the mortgagee by the mortgage deed and the mortgagee is the Government or the mortgaged property or any part thereof was, on the date of the execution of the mortgage deed, situated in the cities or towns specified by the Government in this behalf. The right of sale shall be exercised after giving a written notice to the mortgagor demanding payment of mortgage money and if the mortgagor defaults in making such payment within three months of the service of such notice. For preservation of the mortgaged property form forfeiture, sale or destruction. For supporting mortgagor’s title to the mortgaged property; provided in both the cases the mortgagor was called up but failed to take proper and timely steps. For making his own title good against the mortgagor. For renewal of the lease where the mortgaged property is renewable leasehold. The mortgagee can add the money so spent by him to the mortgage money due to him. He is entitled to get interest on the amount at the same rate as is applicable to principle money. This is one the major rights of a mortgagee. 6. Right to accession to mortgaged property: In the absence of any contract to the contrary, the mortgagee, for the purposes of security, is entitled to any additions to the mortgaged property. For example, if the mortgagor, property, For example, if the mortgagor, after mortgaging a plot of land, constructs a building on it, the mortgagee can also retain the building as security for the loan. 7. Right of possession: In case the mortgage as per terms of the mortgage deed is entitled to the possession of the mortgaged property; (e.g., in case of usufructuary mortgage), he must get such possession.